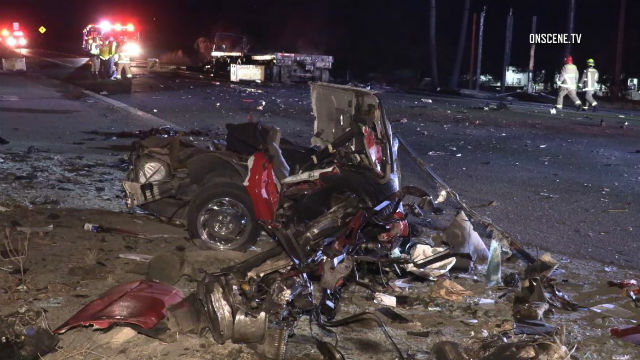 One person died in a fiery collision Friday between a big rig and a speeding red Corvette in the 12700 block of state Route 76 in the Pala area, according to the California Highway Patrol. The crash, reported shortly after 4:30 p.m. near Pala Raceway, forced closure of the state route between Lilac and Cole Grade roads, according to the CHP. Officials at the scene said the driver of the Corvette was ejected and died at the scene. The driver of the truck was not injured, but his truck was destroyed in the fire. The Corvette was reportedly going 80 mph before the crash. Firefighters also responded to reports of a brush fire in the area, caused by the crash, the CHP reported.